WIN WITH OUR NEIGHBOURHOOD COMPETITION! 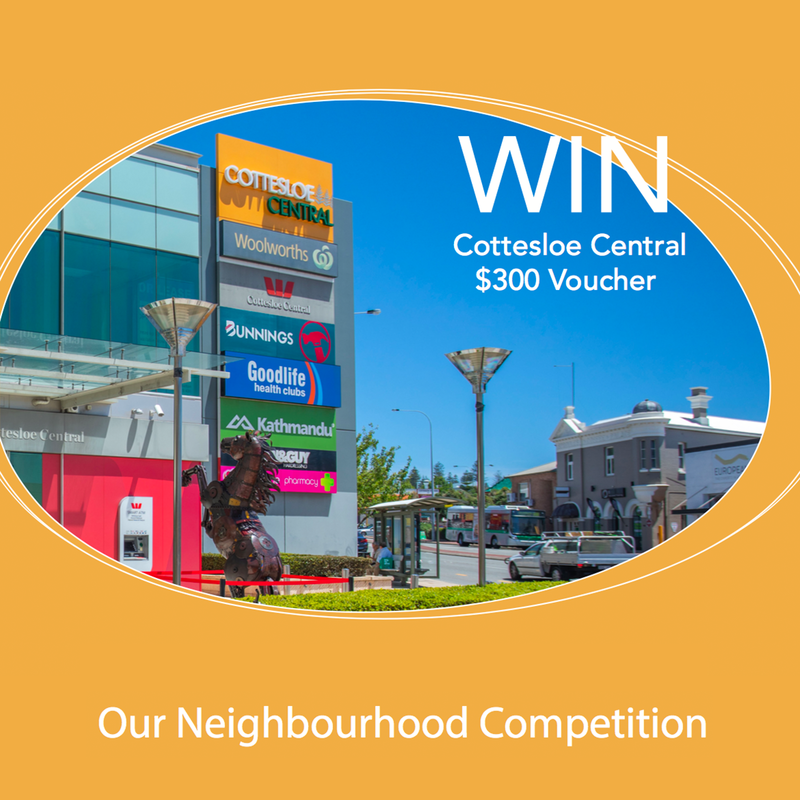 Would you like to win a Cottesloe Central $300 Voucher? 3. Tag @cottesloecentral into your photo. Entries close Sunday, March 3rd. Competition starts 12pm Monday February 11th and closes at 5pm Sunday March 3rd2019. Information on how to enter and prizes form part of the Conditions of Entry. Entry into this competition deems acceptance of these Conditions of Entry. Entry is open to all residents of Western Australia aged 18 years and above, except Centre staff, their families, agents and contractors of Primewest Cottesloe Central and managing agents JLL who are not eligible to enter this competition. Eligible neighbourhood suburb locations: Cottesloe, Claremont, Dalkeith, Mosman Park, North Fremantle, Peppermint Grove, Swanbourne. Upload a photo of their favourite location in our neighbourhood to their Instagram. They must tag @cotttesloecentral into the post. They must follow @cotttesloecentral on Instagram. Entries received via post will not be accepted. 6. Total prize is a $300 Cottesloe Central Voucher. Winner is to identify their preference for spending the total prize, that must include at least one major store (ie. Woolworths, Bunnings) and two (2) specialty stores from Primewest Cottesloe Central. Once the winners has nominated the stores and the $amount per store, then a voucher from each nominated store will be provided to form the total Cottesloe Central Voucher prize package. The prize draws will occur on Tuesday, March 5th; prize winners do not need to be present at the prize draws. There will be one (1) prize winner drawn at random. Winners will be randomly drawn from a computer generator and will be contacted via Instagram. Winners will be announced on Primewest Cottesloe Central Facebook & Instagram pages. The prize winners will be responsible for liaising with Primewest Cottesloe Central Shopping Centre representative to arrange redemption of their prize. The gift voucher elements of prizes may be subject to individual store gift voucher conditions of use; prizes cannot be redeemed for cash. Further Terms may be applied by the prize venue if required. Primewest Cottesloe Central Shopping Centre reserves the right to deem any entry invalid if it breaches the nature of the promotion. Primewest Cottesloe Central Shopping Centre reserve the right to alter, modify, suspend or cancel the promotion. The promoter shall not be held liable for any loss or damage whatsoever, which is suffered or sustained by any person as a result of the use of, or in connection with the promotion, including loss or damage suffered as a result of negligence, but not including liability which cannot be excluded by law. The Promoter reserves the right in its sole discretion to disqualify any individual who the Promoter has reason to believe has breached any of these conditions, or engaged in any unlawful or other improper misconduct calculated to jeopardise the fair and proper conduct of the promotion. The Promoter’s legal rights to recover damages or other compensation are reserved. By entering into this promotion each entrant provides consent for the promoter and permanent tenants of the Primewest Cottesloe Central to use the information supplied for various commercial purposes, including marketing, planning and research. All entries become the property of the Promoter and cannot be returned. Entrants in this competition will be placed onto a subscriber database for future email communications by the centre. This promotion is offered in good faith and is not to give rise to any legal dispute and is binding in honour only. Details and images collected may be used for marketing purposes.